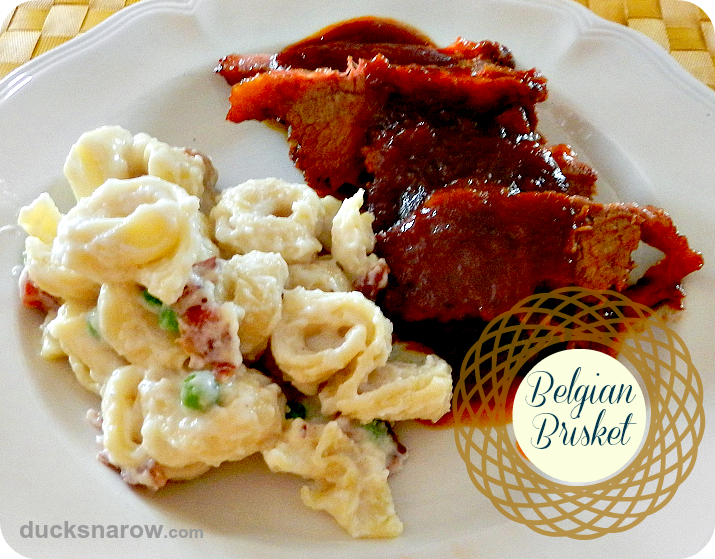 It always was a special treat to have Belgian Brisket on a holiday table. My mother made this recipe for many special occasions Served with Tortellini Alfredo –or au gratin potatoes– green veggies and corn bread, this is a meal that cannot be beat. Place beef in roaster, fat side up. Arrange onions, celery, chili sauce & tomato sauce on top. Add ¼ cup water in bottom of pan. 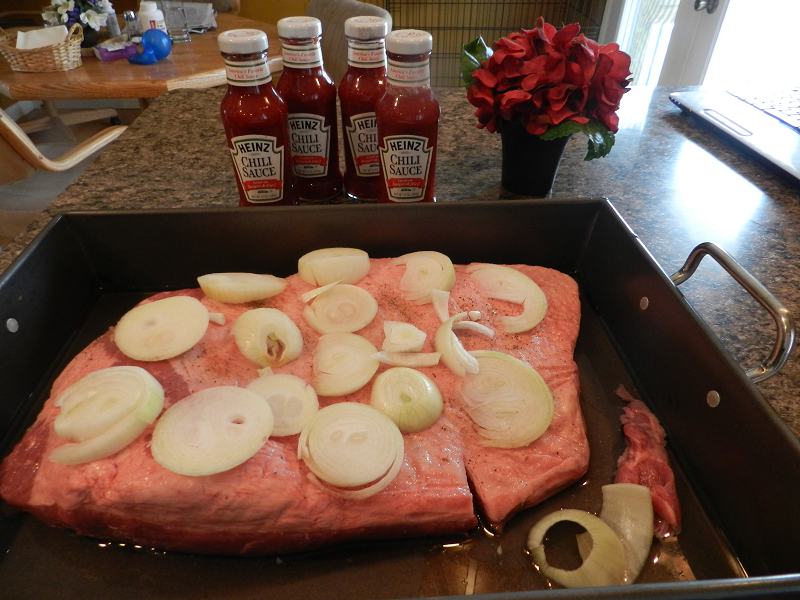 Roast in the oven , uncovered, 1 hour per pound at 325°. Baste often until meat is well browned. Cover. 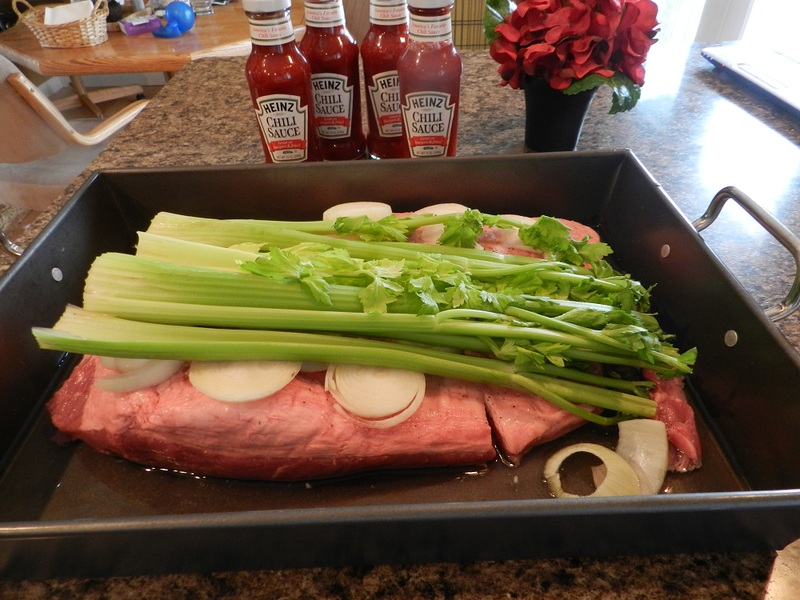 After beef has cooked 3 ½ hours, pour beer over. 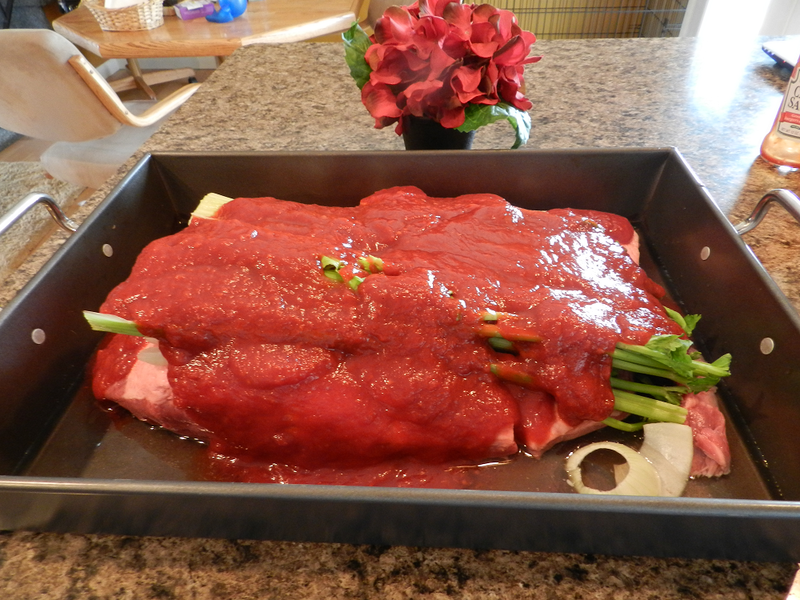 Cover again and cook another 1 ½ hours or until beef is tender. Strain gravy into bowl and cool until fat rises. 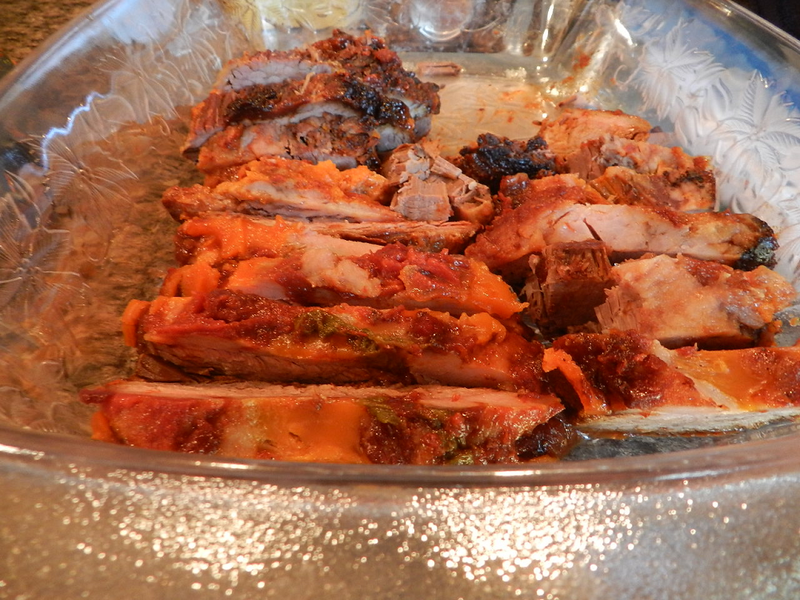 Carve the layer of fat off the top of the meat and discard. Reheat gravy, adding up to ½ cup water if needed. When I first tasted Tortellini Alfredo, it was at my best friend Rosemary’s house. She is 100% Italian and such a gifted cook. She served it as a side dish at Sunday dinner with homemade meatballs, sauce, linguine, pork (also cooked in the sauce), tossed romaine salad with black olives, cherry tomatoes and so on, plus homemade Italian bread. Oh my goodness, what a meal! 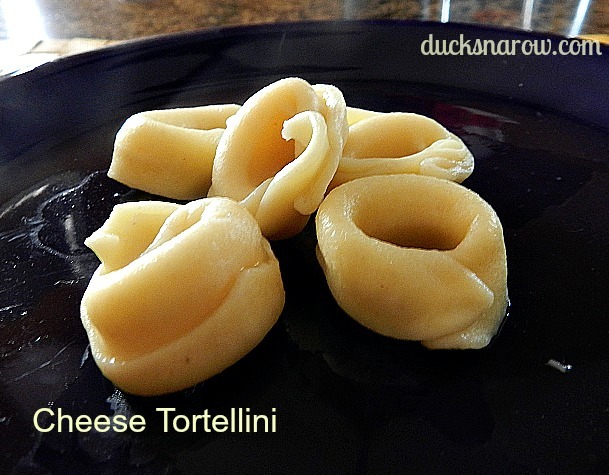 I had never had tortellini-anything until then. That first dinner introduced me to one of my favorite foods. Wow! I walked away with the recipe. I wasn’t going to let this one get away. Creamy homemade Alfredo sauce mixed with cheese tortellini, bacon and peas. Simple! Caution: everyone overeats when this is served. I consider that to be a great indication of how wonderful it is. Fill a large pot of water and bring to boil. Add frozen tortellini and cook on high for 3-4 minutes. Tip: you’ll know that they are ready when some of them are floating on the water. In separate saucepan, melt butter. Add flour and whisk in with the butter. Add milk gradually, while stirring. Allow to come to a boil (still stirring) till it thickens. Add Romano cheese and whisk again. Pour into tortellini in the big pot and stir. Combine by adding the cheese sauce to the tortellini in the large pot. Rosemary served her Tortellini Alfredo alongside meatballs and sauce. I often serve it as a compliment to Belgian Brisket . Cornbread is also a great addition to this meal. What recipes do you use?